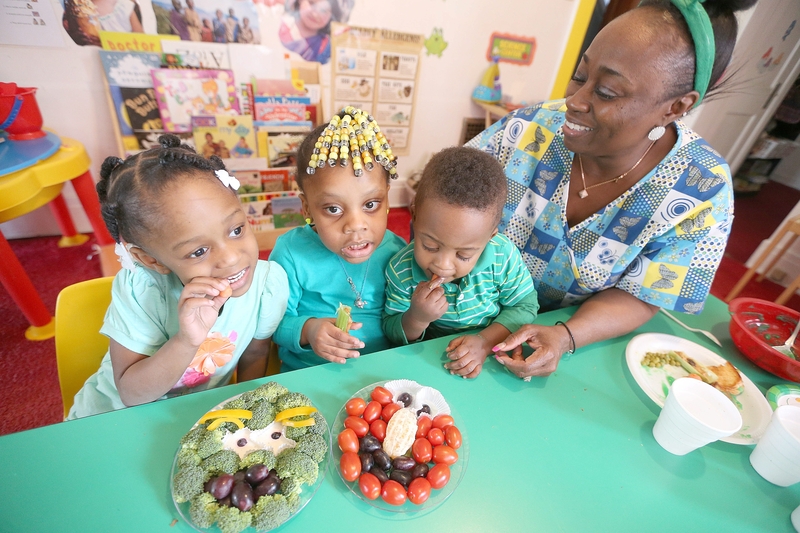 From left, Kennedy Jackson, 4, Trinity Simmons, 3, and Josiah Hutchinson, 2, munch on healthy snacks with Renee Benning at Something Special Day Care in the University District. When it comes to food, most kids are followers. Take Kennedy Jackson and Trinity Simmons, 4 and 3, respectively. The answers have less to do with passion than peer pressure and training. Kennedy and Trinity learned to love what they eat with support from their parents and three meals a day under the watchful eye of Renee Benning, owner of Something Special Day Care in the University District. That’s where the Child and Adult Food Care Program, part of the Child Care Resource Network, steps in for thousands of children across Erie County who receive two partially subsidized meals and a snack each day – provided those meals are healthy. Antoinette Davis, a licensed day-care provider for 27 years, has run the program for about seven months. Before that, Kimberly Backey, interim executive director of the child care network, was in charge of the food end. Benning has participated in the program for 21 years, so these three women have soaked up lots of knowledge, and strategies, when it comes to feeding kids right. “When they’re not with their children all day, sometimes parents will just say, ‘If you want hot dogs and french fries, that’s what we’ll have,’ ” Benning said. That recipe – parts parental guilt, exhaustion and exasperation – has pushed up the obesity rate during the last two generations, though the rate during the last decade has fallen for children 5 and under. That’s important, Backey said, because children who eat healthier tend to do better at school, are less likely to be overweight and need to visit the doctor less often. There’s something to be said for the old Buddy Hackett adage – “As a child, my family’s menu consisted of two choices: take it or leave it” – but there are tricks to healthy eating that can ease that bottom line for families. 1. Be persistent: “Children generally will say no first to something that looks different, so you have to introduce it to them several times in different ways,” Davis said. That can frustrate parents who’ve had busy days and are trying to jam in dinner with homework and other evening activities. “It does take extra time,” Benning said, including buying the right foods and preparing them, even if it has to be on weekends for a healthier supply on weeknights. But the payoff can last a lifetime. 2. Presentation matters: “Adults aren’t the only people who eat with their eyes first. Children do, too,” Davis said. Kids like colorful foods, and Davis has found several ways to beef up the visual appeal of some of the healthiest among them, including making smiley faces on low-fat peanut butter sandwiches, shaping a whole grain bread and fruit snack into a fish shape, and packing fruit, veggies and protein into the shape of a race car using low-fat peanut butter. 4. Be sneaky: Davis and her mother, Dorothy Ransom, long ago became masters at this. “Children hate anything green,” Davis said, “but you dress up some food and kids don’t know that it’s broccoli and they say, ‘Oooh, that tastes good.’ ” Davis also bakes spinach or grated carrots into her meatloaf – which is made from ground turkey, not beef. “The kids don’t know they’re eating carrots,” she said. “They just know that the meatloaf is sweeter.” She also makes “purple smoothies” using pineapple, plain yogurt and beets. “When you tell the parents their children had broccoli or spinach, they don’t believe you,” said Davis, who has passed along her recipes to several thankful parents. 5. Think local: “Before we started doing field trips at our day care, all the kids thought food came from the grocery store,” Davis said. The food program has reached out to local farmers and plans to encourage day care providers to consider Community Supported Agriculture this year. “The children will get fresh fruits and vegetables,” she said, “and children will know that strawberries or potatoes or carrots don’t grow in a supermarket, that they come from a farm and people work really hard to get fruits and vegetables to you.” Planting a garden, she said, is another healthy way to introduce children to healthy food. 7. Remember who’s in charge: In the end, it’s up to parents to help their children make healthy eating choices, including trying a variety of foods, limiting portion sizes, take-out meals and processed foods, and leading by example. On the Web: Parents can learn how the Child Care Resource Network can help them find licensed day care and day care providers can find out how to plug into the agency’s food program at blogs.buffalonews.com/refresh.